ORLANDO, FL--(Marketwired - Jan 22, 2015) - Full Swing Golf, the San Diego-based golf simulator leader in golf simulation technology for entertainment and training performance, announced today that one of the most iconic figures in sports, Tiger Woods, has entered into an exclusive multi year partnership. "We couldn't be more excited to work with such an icon of the sport who is one of the most talked about athletes in all of sports," said Ryan Dotters, CEO at Full Swing Golf. "We're extremely proud to have guidance from one of the greatest athletes of all time on future product development and truly becoming the leader in sports technology"
The winner of 105 tournaments, 79 of those on the PGA TOUR, including four Masters Tournaments, four PGA Championships, three U.S. Open championships and three British Open championships, Woods became the first player ever to hold all four professional major championships at the same time. 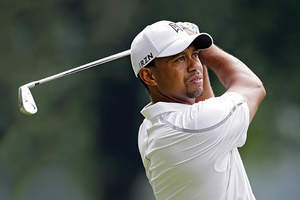 "I've used a Full Swing Simulator for years at The Champions Grill at Isleworth and thrilled to now have their latest products at the clubhouse of El Cardonal at Diamante the first Tiger Woods designed course and also at my home in Jupiter," said Woods. "Ryan has shown me the long term vision for the company and the product pipeline for the next several years and I couldn't be more excited to be a part of the Full Swing Golf family." About Full Swing Golf, Inc.
Full Swing Golf is committed to expanding simulated athletics and creating multi vertical technology solutions across global sports. Full Swing Golf is headquartered in San Diego, CA. For further information, please visit the Company's website at http://www.fullswinggolf.com. Tiger Woods and Full Swing Golf enter into exclusive partnership.